South Africans have a wide choice of new double-cab bakkies to choose from, with Toyota, Ford, Nissan and Isuzu vying for sales in the congested market. 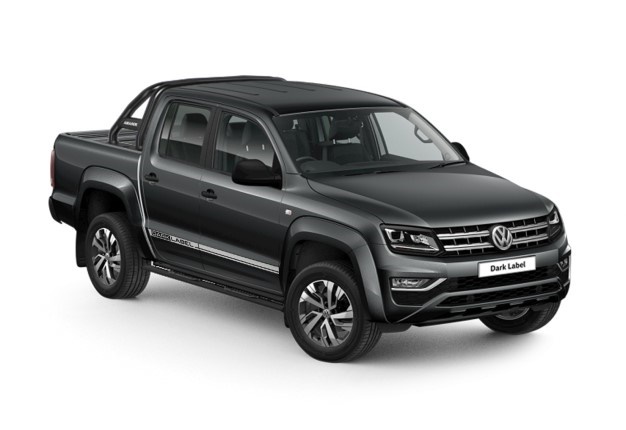 In late November Mercedes-Benz added a V6-powered model to its X-Class range and now Volkswagen has added the Dark Label edition of its Amarok. It's powered by the familiar 2.0-litre bi-turbodiesel engine with 132kW and 420Nm of torque. The engine is paired with a 8-speed automatic transmission and permanent four-wheel drive. The German automaker says they've sold over 30 000 in Mzansi since launch in 2010 and in a bid to stay to relevant with consumers they've launched this smart-looking version. The exterior is set apart by wearing a locally-sourced MAXE matte black styling bar with 'Amarok' lettering, door handles and exterior mirrors in matte black, matte black highlight front protection grille with dark chrome lacquered ledges, tinted rear windows, blacked-out B-pillars, black side sills, 'Dark Label' décor film on the sides, smoked taillights and fresh 18-inch 'Rawson' alloy wheels. Inside you'll find new black 'Greenhouse' headlining, leather seats, silk glance chrome air vent borders and floor mats embroidered with 'Dark Label' lettering. Specification-wise, this model is fitted standard with bi-xenon headlights with LED daytime running lights, front and rear park distance control, tyre pressure monitor, 'Plus' multi-function on-board computer, 'Composition Media' infotainment system, app-connect with voice control and a multi-function steering wheel. A comprehensive list of safety equipment comes as standard on the special edition Amarok, including on and offroad Electronic Stabilisation Programme and Volkswagen's award-winning Automatic Post-Collision Braking System which can reduce the chance or severity of a secondary accident in the event of a collision. Optional features: seat heating (winter package), increased GVM/ heavy duty suspension, rear view camera, climatronic air-conditioning, 'Discover Media' infotainment system (including Satnav) as well as rubber floor covering for the cab and passenger compartment. A three-year or 100 000km manufacturer warranty, five-year or 90 000km Genuine Automotion Service Plan are included in the price.